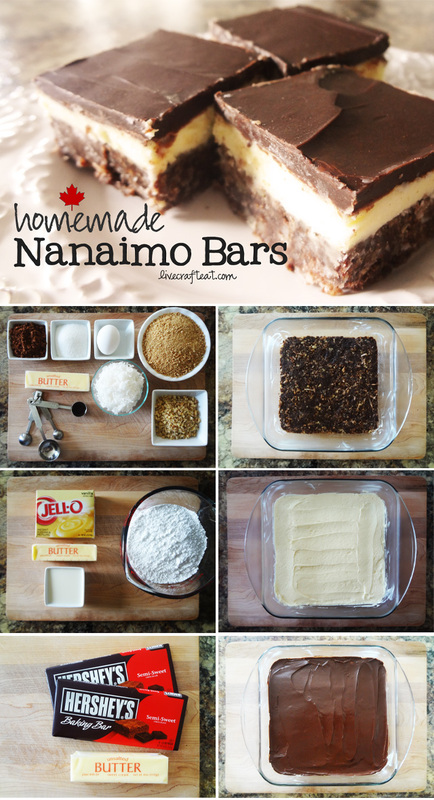 a good friend of mine sent me the recipe for these nanaimo bars so i could make them this past canada day. being away from home, there are some things i miss, and nanaimo bars are definitely one of them! we used to be able to buy them from a local store, and i’m telling you – they’re addictive! even my american husband converted 😉 i’m so glad i now know how to make this amazingly delicious canadian treat! and you can, too…. 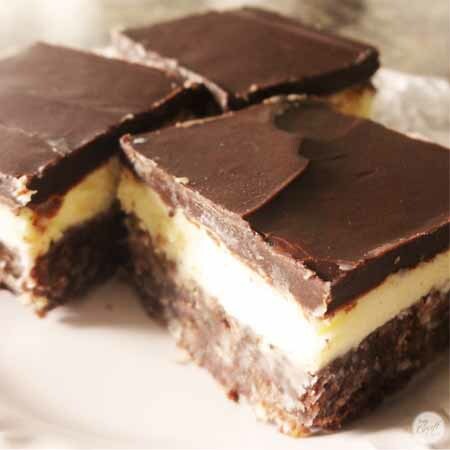 Homemade nanaimo bars - a Canadian classic. BASE: melt butter in a medium saucepan. add sugar and cocoa and stir until smooth. whisk egg with vanilla and stir into butter mixture. remove from heat - no scrambled eggs here! stir in graham cracker crumbs, coconut, and nuts. press evenly over bottom of a greased 9x9" square pan. chill until set, at least 20 minutes. FILLING: beat butter with wooden spoon until light. beat in custard powder (or pudding powder) and milk. gradually beat in sugar. spread over chilled base and let set in fridge. TOPPING: melt together chocolate and butter; stir until smooth. spread in an even layer over chilled filling. store in fridge until chocolate topping begins to harden, about 10 minutes. score topping into bars - cut into small 1-inch squares before totally solid. if needed, use a hot knife and wipe clean between cuts - otherwise the chocolate will start to crack. store in fridge or freeze for up to 2 months. enjoy! Oh, thank you, thank you, thank you and God bless you! I’m a Canadian in the US, too, and miss these soooo much at times. Will definitely make these for parties!! Do you usually use salted butter for this recipe? Sounds wonderful! Love chocolate — maybe too much, but I’ve loved it for decades!